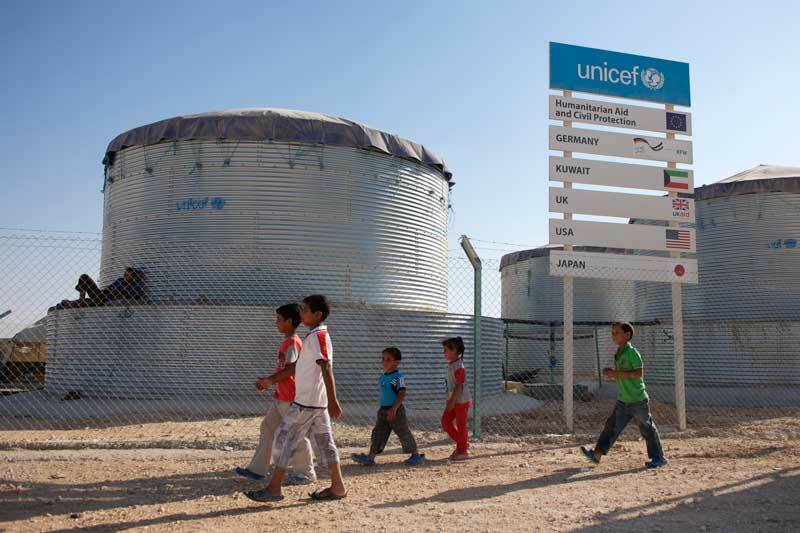 Water tanks in Za’atari camp, Jordan, 2013. Photo: UNICEF Jordan. Growing water scarcity has driven the Jordanian government to develop a water demand management strategy to maximize water use efficiency and minimize wastage. The strategy includes measures to increase irrigation efficiency, broaden the use of treated wastewater in the agricultural sector and, in the longer term, carry out seawater desalination at Aqaba, possibly as part of the Red Sea-Dead Sea Project. A great number of national and international players are involved in the Jordanian water sector, which results in a complex governance structure in which institutions and organizations sometimes have overlapping functions. We will only highlight the main actors at the national level in this report. Established in 1988, the Ministry of Water and Irrigation (MWI) is the main public water institution in Jordan. The ministry operates at policy-making level and is responsible for outlining the country’s water strategy, creating the national master plan for water use, preparing water studies and monitoring water resources. The Water Authority of Jordan operates under the MWI and is responsible for the operational management of water resources and the organization of water supply and wastewater treatment in the highlands. For example, the authority has the mandate to manage threatened groundwater resources through its control over groundwater pumping licences. The Jordan Valley Authority also operates under the MWI. Its overall mandate was to create a plan and conditions for comprehensive development (farming, industrial, municipal and tourist purposes) in the Jordan Valley area and to protect all water resources in the valley. The Water Authority of Jordan has developed a policy to allow private initiative in the water sector in the form of private water companies and public-private partnerships. Aqaba Water, which handles water supply and wastewater treatment, is an example of a water company with a large share of private control. Another example is the al-Samra wastewater treatment plant, which handles the wastewater of the Amman region. The organizational set-up of the plant demonstrates how private experts can help the public Water Authority of Jordan to optimize its facilities. The MWI has also started implementing private-ownership principles in newly established government-owned companies, such as the Aqaba water company, Miyahuna, for example. Its success is reflected in the resultant speed and flexibility in responding to people’s needs and implementing new projects. MWI intends to replicate this process by establishing water companies along the same principles in the southern governorates of Karak, Tafileh and Maan. Ministry of Water and Irrigation, 2012. Annual Report.